In preparation for Network Rail’s infrastructure improvements to the Crossrail route between Paddington and Reading, Track Access Services were engaged to acquire accurate 3D data using a rail mobile survey which was conducted using terrestrial laser scanning. The data collected supported the design stages for the Crossrail project, currently Europe’s largest construction project, and set to link London’s main employment centres, ease congestion, and improve connections to mainland Europe by 2019. 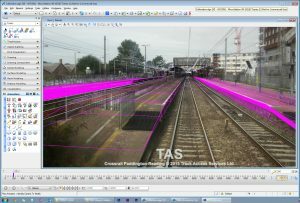 TAS LAS Works v1 was used to make rapid conversions of the whole LAS pointclouds to SnakeGrid format using the XRail09 parameter file. TAS Video in Microstation Bentley add-in was used to convert the positional video frames for SnakeGrid using XRail09 to supply video into the Microstation models, allowing modelling teams to view the models in current track conditions. TAS Geotools has also been upgraded and enables various types of xyz positional conversions; using this we have just completed some signal positions conversion to support Network Rail at Derby. For more information about TAS SnakeGrid tools please call Alison Donovan on 01763 261708.